Grips are one of the often overlooked components on a pro scooter. Riders typically don’t pay attention to their grips until it’s too late, yep when their hands are all callused or when their grips are peeling off. Before recently it was mainly ODI as the only real player in the scooter grips category but now all of the industry-leading brands are making grips and even some smaller parts companies are throwing their grips into the mix. Comfort is extremely important and probably the most important factor in our minds. If your grips are rough or uncomfortable it’s going to make your riding sessions less enjoyable. 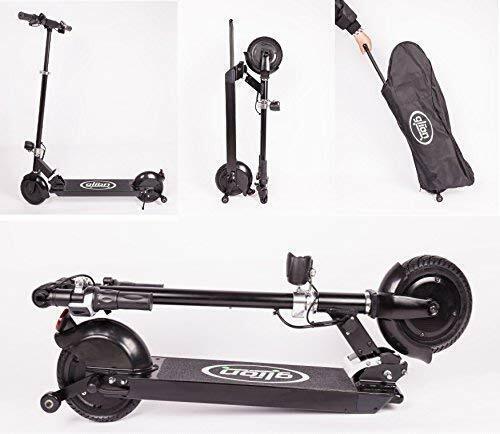 You won’t be able to ride your scooter all that long and even worse over time you’ll develop blisters and nobody has time for that. Selecting a pair of grips that are comfortable is what you focus on when making a decision. Durability is probably second to comfort in the most important factors to consider when selecting grips. You don’t want to be replacing your grips frequently as it just a pain to do and also if you buy grips you don’t want to waste your money on crappy grips that peel apart. The perfect pair of grips will be soft, durable and look good. That brings us to our last point…Style! Nowadays long gone are the times when there were only solid “ODI” style grips. Everyone has their own unique take on grips. Custom bar ends and urethane blends are abundant but there is still a lot of junk out there. Plenty of crappy cheaply made grips that tear up after you spend 30 minutes wiggling them on with a boatload of zip ties. There are lots of cool colors and patterns available, glow in the dark, the overused swirl effect and other graphic prints. Select something that you like and complements the color scheme of your set up. 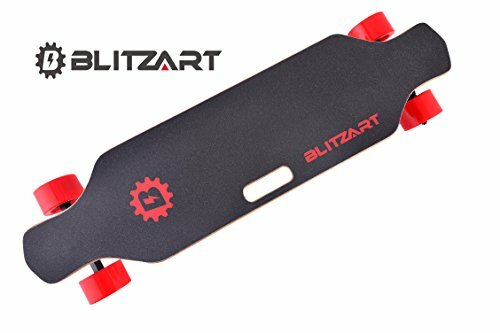 Below you’ll find the top 5 scooter grips on the market, our list takes into consideration price, durability and comfort. Eat your heart out Envy, Fasen and ODI Fuzion pro scooters did an amazing job on their all-new “Hex” Grips. These top our list of the Best Scooter Grips for a few reasons but namely the way these grips feel in hand. Fuzion lists them as “extra wide” as they are 155mm in overall width when measured with a tape. The way these grips feel in hand is amazing, they are soft but not too soft and firm but not too firm to where they are going to cause blisters. Hex Grips are really just right! Really the best way to describe these grips is like the porridge in the three little bears stories absolutely perfect. 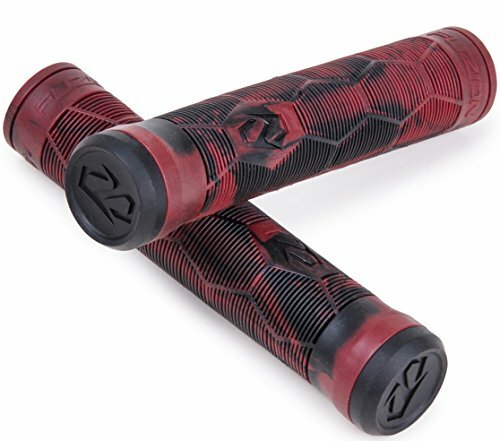 If you need some fresh grips because yours are dead try these Hex Grips by Fuzion we are absolutely sure you’ll love them. 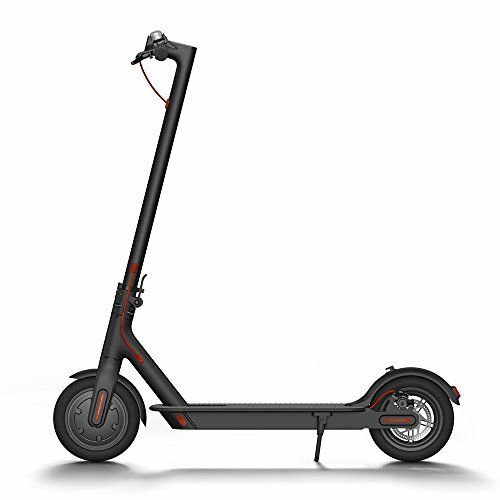 Available in 4 colors you’ll be sure to find a pair that complements your complete scooter. Coming in at #2 is Fasen with the Fast grips. 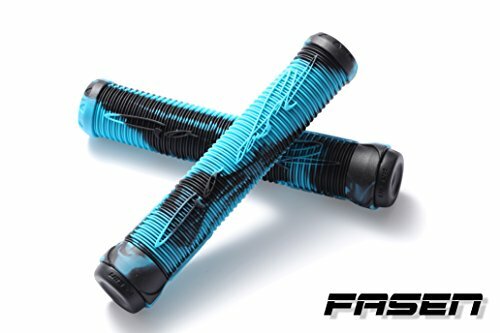 These grips top the list when it comes to styling, Fasen made sure that no matter who walks into a pro scooter shop looking for grips they will find what their looking for from Fasen. Available in 8 different color options they made sure to be appealing in the color offerings department. The Fast grips feel great and are made from a very nice urethane material. Originality is actually on the side of Fasen in this case as we believe they were some of the first with the “swirl” design. To be honest we are sick and tired of swirl grips and are ready for the next trend in grips to hurry up and come. Our verdict on these grips is that they are amazingly soft, durable and come in almost every color combo you can think of. A sure bet every day of the week! 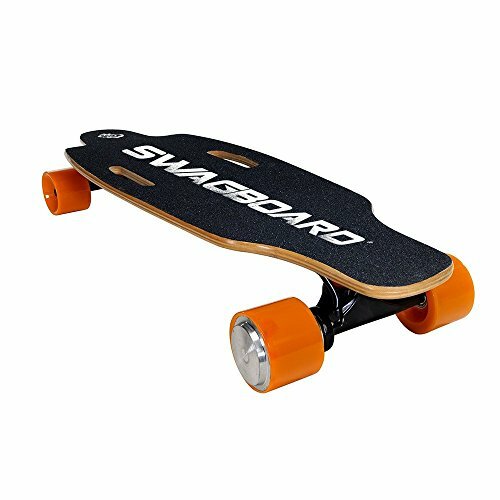 It’s funny that Grit advertises these as flangeless, now every grip is flangeless unless you’re talking some Plashion scooters or Outon. These grips are composed of TPR which is supposed to be the most durable material you can get for grips. 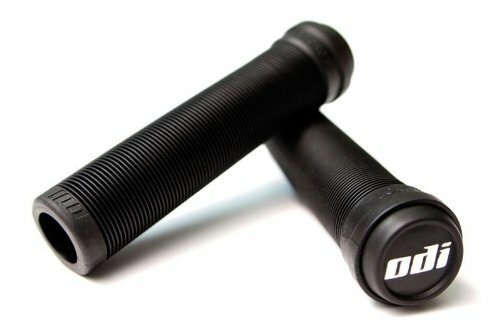 These Grit scooter grips are legit because they will fit on any bars you might be riding. They feature a ribbed pattern for comfort and pleasure while riding. Sounds like a commercial for another industry… but i’ll leave that one alone :-). Length on these bad boys is 160mm which is longer than the Fuzion and Fasen grips. 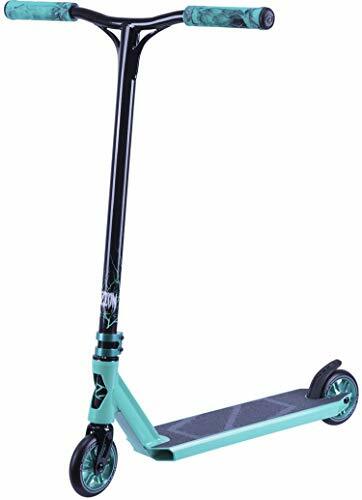 While these grips are top quality and look great the fact that they are available right now in 2 medicore colors drops them to the #3 spot on our top 10 best pro scooter grips list. The market leader for forever, ODI grips are consistently GREAT. If you are political and into USA commerce and feeding into the local economy and creating jobs in American then you should by all means by ODI as they are the only grip on this list made in the USA. These grips are legendary for their durability, comfort and stellar colors. However, they have looked exactly the same forever! What we’d like to see is something new and cool from ODI. Just stir the pot up a little bit, everyone knows they make the best grips performance wise but they need some help in the styling department. As soon as ODI releases a new style, pattern or graphics package they will surely top the grips list again but for now due to the redundancy we are going to stick them at the #4 spot. If you want grips that will never let you down these are for you. 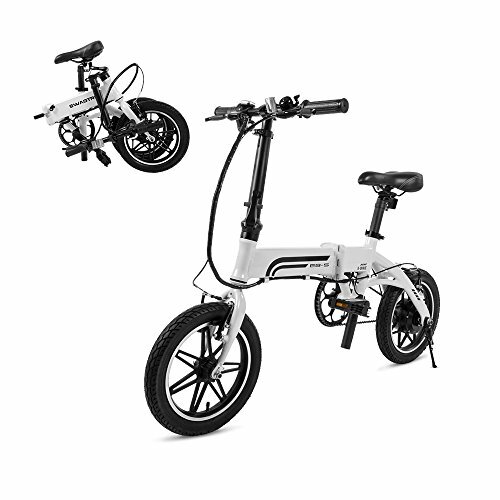 On the flip side is you want something that is going to make your scooter pop these might not be for you. With all of the style and pattern options available we’d suggest one of the sets of grips mentioned above. Last but not lease on the list are the grips by Vans and Cult ( a bmx brand), while these grips were technically designed for BMX they work great for scootering. On the qualification scale these bad boys top the charts in style. 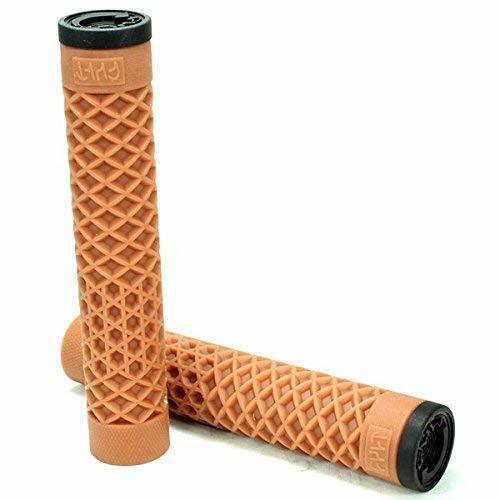 Featuring the sole pattern from the classic Vans shoe collection these grips are super cool. While everything about these grips looks amazing we aren’t too sure about the waffle pattern on hands for extended periods. Once you’ve been riding for a while and work up a sweat these grips also get a little slippery so exercise caution there. Overall these grips are probably our favorite in the looks department but they are a little short at only 150mm they are the shortest grips on our list. Available in 4 different colors these grips are an amazing option. 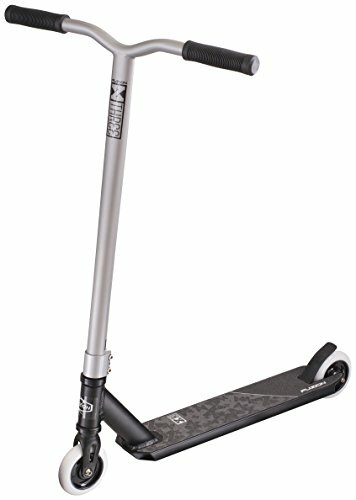 If they were longer and made specifically for scooters and not BMX these might have appeared a lot higher on the list. Still all in all these are a great alternative to scooter specific grips.